The U.S. Department of Treasury published a report looking at the impact of the Small Business Lending Fund (SBLF), which was established as a part of the Small Business Jobs Act of 2010. The SBLF is a $30 billion fund that provides capital to community banks (with assets less than $10 billion) to increase their small business lending. The program has allowed the Department of Treasury to invest over $4 billion in 332 institutions. 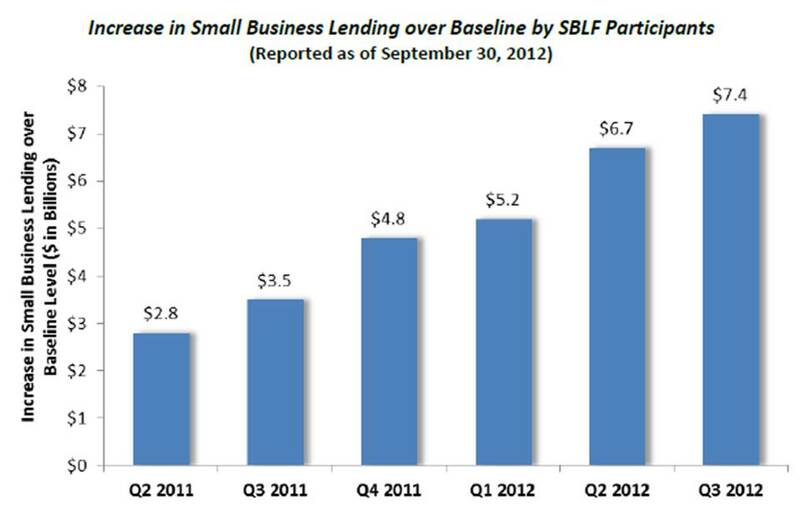 The report shows that participants in the SBLF have in fact increased their small business lending by $7.4 billion over a baseline of $36.5 billion. Three-quarters of the participants in the program have increased their small business lending by 10 percent or more. When compared to other similar institutions, SBLF banks have seen much greater increases in their outstanding loans– 32.3 percent increase, compared to 5.7 percent for banks within their peer groups, and 2.1 percent increase for banks that are in a broader comparison group. The Charlotte Observer reports that North Carolina institutions saw an increase of $205.3 million in small business lending through funding provided by the SBLF. There are seven North Carolina banks that have participated in the SBLF program, some of which have seen significant increases in their lending to small businesses. Live Oak Bancshares out of Wilmington, which received $6.8 million from the SBLF, saw an increase in small business lending of almost 130 percent. Select Bancorp from Greenville, which received $7.7 million, saw an increase of about 60 percent. This is all good news for small businesses and for community banks. The SBLF is not only expanding access to capital when the larger banks have receded from lending, it is also providing support for smaller, alternative lenders. In the landscape of small business lending, as the big banks continue to pull back and as the market continues to tighten, other community based lenders and banks will be stepping in to provide services and resources. Community banks, community development financial institutions (CDFIs), and credit unions will play a larger role in small business lending. It is encouraging that federal programs such as the SBLF are having a positive impact. Credit Union Magazine offers insight into what the impact might be on credit unions in the worst-case scenario that we do fall off the “fiscal cliff.” So far, no deal has been made to avert the cliff, although the Credit Union National Association’s (CUNA) senior economist Steve Rick predicts that it’s likely some deal will be made that essentially kicks the can down the road. The major impacts on credit unions will be due to the uncertainty faced by their members. If the U.S. economy is thrown back in a recession, people will be fearful of losing their jobs, will have less disposable income, and overall will be less inclined or able to take on any additional risk. A drop in income for credit unions means that they will be more restricted in their own operations and programs. Things like new branches and new hires will not be feasible. But ultimately, it’s the impact on credit union members that will be the biggest blow. A fiscal cliff emergency loan, which allows members to borrow up to $5,000 at 4.99% (0% for the first 60 days) with a maximum 12-month term. Members may defer their first payment for 60 days. Hopefully other credit unions will follow Belvoir’s lead in addressing their member’s concerns and challenges, no matter what the outcome of the current fiscal policy debate. Educating members about the fiscal cliff impacts– and the impacts of fiscal policy overall– is also key. The decisions made in Washington are not just about policy debates. Every individual, family, and community is affected, and it’s important that people are aware of and engaged in these important debates– and that they have financial institutions ready and willing to help them navigate these uncertain economic times. This will be the last post of the year for The Support Center. Wishing you all the best this holiday season! WUNC featured a story on The Support Center’s new report on community development financial institutions (CDFIs) in North Carolina. Our President/CEO, Lenwood V. Long, Sr. was interviewed about the important role the CDFIs play in expanding access to credit to entrepreneurs across the state. Click on the link below to listen to the story and share!